Crete has some great scenery and bridges for jumping off, with a bungee rope attached of course! There is one main company that offers bungee jumping on the island and this is serious bungee jumping of great heights. If its bog standard Crete bungee jumping experiences you are after, then Star Beach in Hersonissos offers the standard crane over the sea affair. But if you’re looking for something that little extra then you have to try a Crete bungee jump off Aradaina bridge near Sfakia. For this article we will be concentrating on the main bungee jumping that can be done in Crete from a well known bridge called Aradaina bridge. Liquid bungee have a few select videos from people that have jumped from Aradaina bungee site in Crete and you can find that on their website. Aradaina bridge is 138 meters high and is located near Sfakia in the prefecture of Chania in Crete. It is the highest bridge in Crete and in fact the whole of Greece. It is also the 2nd highest bridge you can bungee jump from in Europe. The main company that does bungee jumping on this bridge is Liquid Bungee, a very reputable firm with all the required safety certificates and licences. This company set the Balkan record for the highest bungee jump within Greece and have been operating since 1999 on the bridge in question. The company starts doing Crete bungee jumping from the Aradaina bridge usually at the beginning of June and finish up the season in august. Jumps take place every weekend throughout the summer. 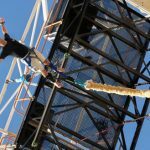 You can find full safety information and contact details for the company who runs the bungee jumping in Crete at their website here: Liquid Bungee. The bungee jumping pictures used in this article are from the liquid Bungee website. If its a spur of the moment bungee jump in Crete your looking for then head over to the town of Hersonissos, at Star Beach you will find the do the bungee rocket and bungee jumping over the main beach area. It works out much cheaper than Liquid Bungee in Crete but the rush and thrill is not so high due to the fact its just a regular bungee jump from a much lower height than that of Aradaina bridge. 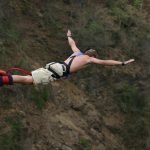 For those that need to know about the safety aspect of bungee jumping abroad then you can rest assured that Liquid bungee follows the “Bungee Jumping Code of Practice and its internationally recognised in its field for 100% safe jumping and the standard of material used.